1. Fr. Gabriel Bernaba, Teacher of Coptic Language at the Institute of Coptic Studies and Didymus Institute for Cantors in Cairo. 2. Dr. Mishil Badae Abdelmalek, Head of the Hymns Division and Coptic Music at the Institute of Coptic Studies, and teach of Greek Language (Ancient, Koine, the pronunciation used for the Holy Bible and liturgical texts) at the seminary schools and Institute of Coptic Studies. For the studying of the pronunciation of liturgical texts used in the prayers and hymns of the Coptic Orthodox Church which have been circulated through the recordings of the Institute of Coptic Studies of Cairo and were recorded by the Late Dr. Ragheb Moftah, head and founder of the Music and Hymns Division of the Institute of Coptic Studies starting in 1927 from the most renowned cantor of the Coptic Church, the late teacher Mikhail Girgis El Batanouny, and the first direct generation of his disciples, Cantor Tawfik Youssef Elnaikhili Elmuharrai, Cantor Farag Abdelmaseih, and Cantor Sadek Atallah. 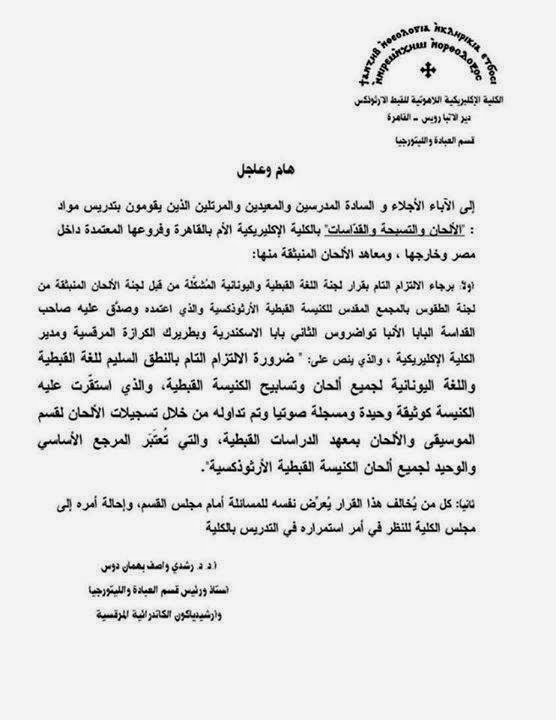 The committee has found that the pronunciation used in the recordings of the Institute of Coptic Studies is the primary source for using in all hymns and prayers of the Coptic Orthodox Church and it must be kept from tampering and distortion of pronunciation which our Coptic Church has settled on. The recordings of the Coptic Institute is the primary and only source for all hymns of the Coptic Orthodox Church whether in the pronunciation of Coptic text or in words and texts of the Greek Language which are in according to the old pronunciation of the Greek language (Attic, Koine) and not according to the modern Greek pronunciation which has no relation to the Greek words and texts used in the prayers and hymns of the Coptic Orthodox Church. The committee calls on all cantors of the See of St. Mark, those who teach hymns and praises at the Seminary Schools in Cairo, Alexandria, and all branches, teachers at the Didymus Institute for Cantors in Cairo and the Elmuharraq Monastery, cantors of the Coptic Church inside Egypt and in the land of immigration, choirs of deacons and those responsible for teaching hymns in churches, and those responsible for organizing hymns competitions at the Youth Bishopric, to adhere to the correct pronunciation of the Coptic and Greek languages for all hymns and praises of the Coptic Church, that which the church has settled on and documented and is recorded audibly through the recordings of the hymns by Musical Division of the the Higher Institute of Coptic Studies, which is considered the official primary and only source for all the hymns of the Coptic Orthodox Church. 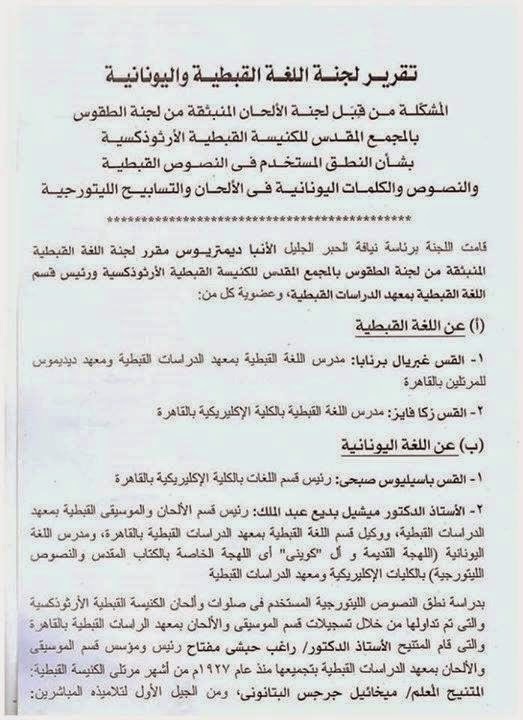 First, please adhere completely to the decision of the Coptic and Greek Language Committee formed from the Hymns Committee of the Rites Committee of the Holy Synod of the Coptic Orthodox Church. The decision was confirmed and signed by H.H. Pope Tawadros II, Pope of Alexanderia and Patriarch of the See of St. Mark and the dean of the Coptic Seminary. 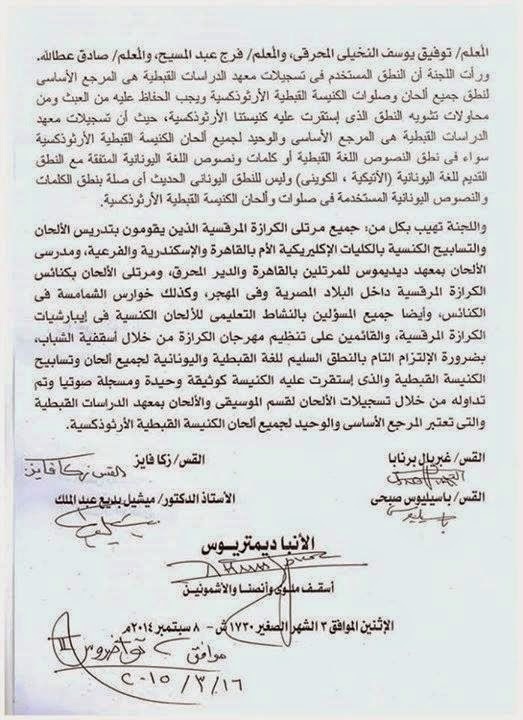 The decision states the "utter importance of the correct pronunciation of the Coptic and Green languages for all hymns and praises of the Coptic Church, that which the church has settled on and documented and is recorded audibly through the recordings of the hymns by Musical Division of the the Higher Institute of Coptic Studies, which is considered the official primary and only source for all the hymns of the Coptic Orthodox Church. Second, anyone who disobeys this decision risks questioning before board of the seminary and possible leave from teaching at the institute.